Although the 2016 Toyota RAV4 isn't a standout in any one area, its combination of features, passenger space and everyday utility warrant a closer look if you're shopping for a small crossover. The Toyota RAV4 gets updated styling for 2016, including a sleeker front fascia. There's also a new SE trim that boasts sharper handling, LED headlights and additional distinctive styling elements inside and out. A new Toyota Safety Sense package available on the SE and Limited includes a variety of high-tech accident avoidance technologies. Finally, a new RAV4 Hybrid also debuts. Roomy interior for people and cargo; strikes a good balance between ride comfort and secure handling; well-sorted tech interface. As any sports fan will attest, sometimes you can have a well-rounded team, play at a competitive level, pack the stands and still fail to find glory. Well, we hereby present that as a metaphor for the 2016 Toyota RAV4. It's spacious, versatile, decent to drive, comfortable and well-equipped, and it also enjoys one of the best reliability reputations in its segment. Trouble is, there are competitors that match or beat it in those areas while going a few steps further in others. To its credit, Toyota has tinkered with the RAV4 this year in hopes of improving its appeal. The exterior styling has been subtly massaged, especially up front, where there's a more streamlined look that modernizes this crossover's mien. The 2016 RAV4 also adds an SE trim to its portfolio. The SE, following in the footsteps of Toyota's popular Camry and Sienna SE trims, boasts sporty styling flourishes and a suspension tuned for better handling. What thankfully carries over is the RAV4's impressive cabin space. The cargo area is large, boxy and its load floor is low, making it one of the most versatile compact crossovers available. Need to carry the box for a Little Tikes playhouse or lug around a vivacious Weimaraner? The RAV4 is well suited to the task. It also offers one of the most accommodating cabins for passengers. It's this spacious interior, along with the RAV4's history of dependability, that constitutes this compact crossover's primary appeal. Yet, the RAV4 isn't the only model with a polished resumé. The Honda CR-V is just as spacious and dependable, but it can also claim superior fuel economy and an even more versatile cabin. To a lesser extent, the same can be said of the rugged Subaru Forester, which also boasts best-in-class acceleration with its optional turbocharged engine. Then there's the Mazda CX-5, which isn't quite as utilitarian but offers a more dynamic, carlike driving experience. The 2016 RAV4 is a well-rounded, solid competitor that's popular for good reason, but a few of the other members of this league may stand a better chance of winning you over. The 2016 Toyota RAV4 is a five-passenger compact SUV available in LE, XLE, SE and Limited trim levels. There is also a RAV4 Hybrid reviewed separately. The LE comes standard with 17-inch steel wheels, an integrated driver blind-spot mirror, rear privacy glass, roof rails, air-conditioning, a rearview camera, cruise control, a height-adjustable driver seat, a tilt-and-telescoping steering wheel, a 60/40-split folding and reclining rear seat, a 6.1-inch touchscreen interface (Entune), Bluetooth phone and audio connectivity, and a six-speaker sound system with a CD player, an auxiliary audio jack, a USB port and a media player interface. Optional for the LE is the Entune Audio Plus package, which adds satellite and HD radios, traffic and weather information, Siri Eyes Free for iPhones and the Scout GPS Link navigation smartphone integration app. The XLE includes the Entune Audio Plus package plus 17-inch alloy wheels, foglights, heated mirrors, a sunroof, a height-adjustable power liftgate, dual-zone automatic climate control, more aggressively bolstered front seats and a leather-wrapped steering wheel. This year's new SE adds to the standard XLE equipment a sport-tuned suspension; different exterior styling; 18-inch wheels; LED exterior lighting (automatic headlights, running lights and taillights); keyless ignition and entry; heated front seats; an eight-way power driver seat (with power lumbar); driver memory settings; synthetic leather (SofTex) upholstery; steering wheel paddle shifters; a blind-spot warning system; and rear cross-traffic alert. The Limited shares the XLE's suspension and styling, but includes the SE's other equipment along with chrome-clad 18-inch wheels and exterior trim, an auto-dimming rearview mirror, the Toyota Safety Sense package (see Safety section), adaptive cruise control, a 7-inch higher-resolution touchscreen, a navigation system and smartphone app integration. Optional for the XLE and SE is the Entune Premium Audio package, which adds the bigger touchscreen, nav system and smartphone app integration. The XLE's Convenience package bundles those features with keyless ignition and entry, blind-spot monitoring and rear cross-traffic alert, front and rear parking sensors and the Safety Sense package. The SE and Limited can also be equipped with an 11-speaker JBL sound system as well as the Advanced Technology package that includes that system plus a 360-degree top-down parking camera system, front and rear parking sensors and, on the SE, adaptive cruise control and the Toyota Safety Sense package. The 2016 Toyota RAV4 is motivated by a 2.5-liter four-cylinder that produces 176 horsepower and 172 pound-feet of torque. A six-speed automatic transmission and front-wheel drive are standard, and all-wheel drive is optional. In Edmunds testing, an all-wheel-drive Toyota RAV4 took 9.2 seconds to hit 60 mph, an average time for a small crossover with a four-cylinder engine of this size. 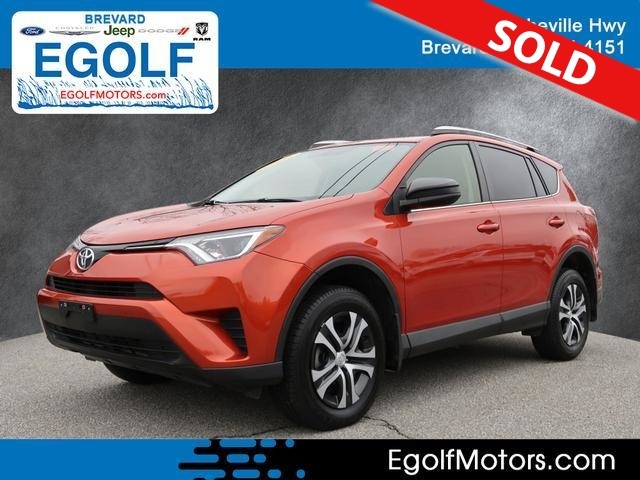 The EPA estimates that the front-wheel-drive RAV4 returns 26 mpg combined (23 city/30 highway) while the all-wheel-drive version returns 25 mpg combined (22 city/29 highway). These estimates are slightly lower than those of certain competitors, notably the Honda CR-V and Mazda CX-5. Every 2016 Toyota RAV4 includes antilock brakes, stability and traction control, front side airbags, full-length airbags, a driver knee airbag, a rearview camera and an integrated driver blind-spot mirror. A blind-spot warning system and rear cross-traffic alert are optional on the XLE and standard on the SE and Limited. The optional Toyota Safety Sense system (standard on the Limited) includes a forward collision warning system (with pedestrian detection), forward collision mitigation with automatic emergency braking, a lane-departure warning and intervention system and automatic high-beam headlight control. In Edmunds brake testing, a RAV4 Limited AWD stopped from 60 mph in 128 feet, which is a few feet longer than average. In government crash tests, the RAV4 received five out of five stars for overall crash protection, with four stars for total frontal protection and five stars for total side protection. The Insurance Institute for Highway Safety gave the 2016 RAV4 the best possible rating of "Good" in the small- and moderate-overlap frontal-offset crash test as well as the side-impact and roof-strength tests. It also received a "Good" rating for the performance of its head restraints and seats, as well as the best possible rating of "Superior" for its available forward collision warning and mitigation system. The 2016 Toyota RAV4 features an interior design with pronounced angles and lines that form a streamlined and modern-looking dash. A few of the audio and climate controls feel slightly flimsy, however, and while the cupholder count is adequate, there aren't as many useful storage cubbies up front as you'll find in the Honda CR-V. If you want genuine leather upholstery, you're out of luck as the RAV4 comes only with cloth or leatherette. Although all of the RAV4's audio systems have Toyota's Entune branding, only models with the bigger 7-inch screen include the Entune suite of smartphone-connected services, among these Pandora streaming radio and a navigation app. Thankfully, the touchscreen interface itself has straightforward menus, large virtual buttons and faster responses for 2016. All conventional controls are also easy to use. Rear passenger comfort is hampered slightly by a low-mounted bottom cushion, but space is nevertheless abundant even for taller adults. We also like how the 60/40-split seatbacks provide a large amount of recline adjustment. The cargo bay measures 38.4 cubic feet and opens up to a generous 73.3 cubes when the second row is folded. That's one of the largest capacities in the class. There's also a payoff for that low-mounted rear seat: a very flat load floor and low load-in height, both of which help minimize the strain of loading heavy items or help dogs jump aboard. The power-operated and height-adjustable liftgate is especially convenient. The 2016 RAV4's 2.5-liter, four-cylinder engine is powerful enough for most tasks and returns pretty good fuel economy. Toyota doesn't offer an optional V6 anymore, though, so if you want more pep you'll need to look elsewhere. The engine's six-speed automatic transmission shifts smoothly, but if you tend to drive assertively, you'll find it slow to downshift in passing situations. Additionally, when climbing steady mountain grades, we've noticed that the transmission has a tendency to hunt between gears (rather than picking one gear and sticking with it). Both of these characteristics are likely a consequence of the powertrain being tuned for maximum gas mileage. We do like how the Toyota RAV4 feels refined and comfortable when cruising down the highway. It's also steady and composed going around turns. Although we've yet to sample the new SE trim, we suspect it will offer a ride-handling balance more akin to those offered by sportier rivals. At the same time, both the SE and Limited come with 18-inch wheels that some may find result in a ride that's too firm and jittery. Overall, the RAV4 is similar in personality to Honda's ultimately more impressive CR-V, less entertaining to drive than rivals like the CX-5 and Ford Escape, and less capable of venturing off the beaten path than the Forester and Jeep Cherokee. Again, it's perfectly pleasant, but it's not a segment standout from behind the wheel.